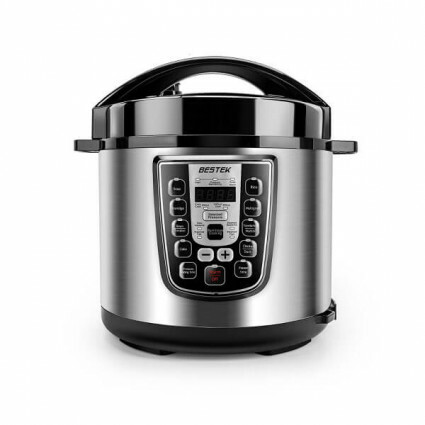 BESTEK programmable pressure cooker is equipped with multiple functions and full safety mechanisms. You can prepare for a many kinds of great meal in advance by timer and pressure adjustment. One electronic pressure cooker replaces multiple other kitchen appliances to reduce kitchen clutter. Large control panel allows multiple cooking modes, including pressure cooker, porridge maker, brown rice cooker, warmer, steamer, soup/stew, slow cooker, reduce kitchen clutter. UL certificated with 10 proven safety mechanisms, ensure you a safer cooking environment. High pressure settings for fast and flexible cooking to save up to 70% cooking time; 24H delay timer allows meals ready anytime you want. Different food can be made with different adjusting. 6L large inner pot, large enough for up to 10 cups of rice; made of high quality 304 stainless steel material, nonstick and durable.